A movement of people committed to global justice. Tens of thousands of members, supporters and activists give their time to take part in the charity War on Want’s work each year. The latest campaign they have supported, Business Against TTIP, is appealing to millions across Europe to stop the deal that could hold public services victim to large businesses and undermine the most basic principles of democracy. 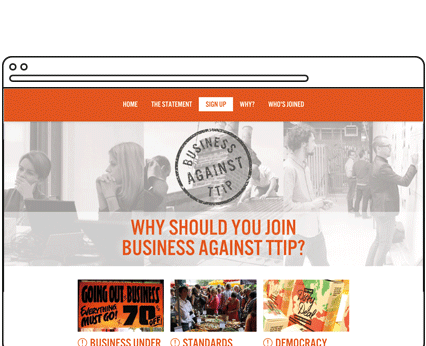 Business Against TTIP and War on Want required a new microsite to enable businesses to pledge and sign up to show their opposition to the Transatlantic Trade and Investment Partnership (TTIP). It was important that businesses and individuals visiting the site could grasp a clear understanding of what TTIP means and then have the opportunity to voice their concerns and say NO to TTIP! To explain the implications of TTIP for businesses we designed clear messages on the homepage, and built a resources section, where visitors can download further reading on the issue. When asking people to register their details it is essential that there are as few barriers as possible. We therefore decided to use Drupal to build the website, as it offers a strong user registration system and would make signing up easy for users. The site is also completely mobile responsive, making the sign-up process clean and easy for mobile and tablet users. We created customised displays of signup results, with the aim of inspiring new users to pledge and share their support. To do this we added integrated social sharing to the sign-up form, so that once a user had made pledge, they could then easily spread the word on various social media platforms. The project also required a logo and identity that would identify Business Against TTIP as a strong and stand alone initiative. The identity had to be flexible enough to be used not only on the website, but also on other media such as posters, badges and flyers promoting the campaign.